A portable solution for the digital DJ. 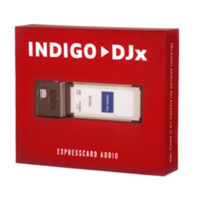 Finally an ExpressCard solution for the digital DJ. Indigo DJ offers two independent stereo 1/8 inch analogue outputs; one for setting up your cue mix on a pair of headphones and the other for the house mix. Each output features 24-bit/96kHz converters for the quality you deserve.